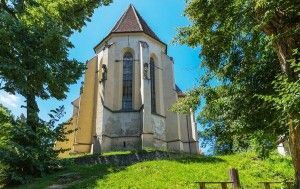 The highest point, 429 meter high, of School Hill in Sighisoara is crowned with the so-called Church on the Hill, dedicated to Saint Nicholas, and without any doubt one of the most iconic landmarks of Sighisoara. One can reach the church by climbing the 176 steps of the coveed staircase (the Pupils’ Stairs), or by following the road that comes up past the school, or deviating from the road half-way up and coming through the Lutheran cemetery another unique site for tourists. According to the inscription on the triumphal arch, the nave that was started in 1429 was finished in 1483. 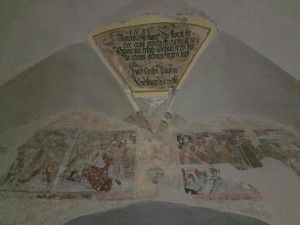 An inscription on the fresco in the west porch dating to 1488 mentions Jakobus Kendlinger from Sankt Wolfgang, probably in his role as painter. “Michel Polner purgermeister (mayor) 1483” must deserve great credit for this phase of the building, as he is mentioned in an inscription on one of the south windows. Some further work was carried out in the following centuries. Between the pair of pillars on the west side, the side walls and the east wall of the tower a trapezoid-shaped balcony was put up. The current balcony was built later, and covers part of the wall frescoes. The year 1525, when the decorative iron work on the south door was made, is considered the date of the completion of the building. When the Saxons converted to the Lulheran-protestant faith in the year 1544, the former Dominican monastery church near the Clock Tower was chosen to be the parish church, and since then the Church on the Hill has been used less. Two later events in the history of the Church on the Hill should be mentioned. In 1704 the roof structure and the bell tower burned during a siege by the Szeklers, with the bells plunging from the tower in a torrent of sparks. Then in the earthquake of 1838 the vault above the choir collapsed and was replaced by a wooden imitation. Through the centuries the Church on the Hill has been repaired a number of times, as witnessed by the inscriptions from 1654, 1655 and 1728. In 1777 the frescoes on the interior walls were painted over with whitewash. The first modem restoration took place in 1934, when the wall paintings were uncovered. From 1993 to 2001 a thorough and complete restoration was carried out, financed by the Messerschmitt Foundation from Munich and the Romanian Ministry of Culture. The altarpieces of the Church on the Hill It is reported that in 1601 an altarpiece consisting of life-sized figures of Christ’s twelve disciples covered in silver was stolen by the Cossacks. In 1934 an altarpiece was removed. It had been created in 1792 from the plans of the Sibiu painter M. Stock, incorporating older elements such as the lovely figures of the four gospel writers carved in lime wood in 1630. This altarpiece had damaged by lightening in 1874. Ludwig Schuller painted a new altarpiece: “Suffer the children to come unto me.” In the opinion of those carrying out the restoration in 1934, “the altarpiece spoilt the spatial effect of the choir and created a very disagreeable image because of its inartistic composition.” For lack of funds they had to content themselves with arranging the four gospel writers in a lively formation around an upright wooden cross. This effectively restored the relationship of the altarpiece to the choir as a harmonious part of the whole. After the major restoration work of 1993 to 1999 the four figures of the apostles from the altar were attached in pairs to the middle pillars in the nave. After the Exodus of the Transylvania Saxons in 1990 many treasures were stolen from the Lutheran churches in the villages. Among these were the valuable altar paintings from the school of Veit Stoss from altars in Fiser and Roades and the baptismal font made in 1440 from the church in Saes. They were found and returned by police in Hungary. The font is now in the choir of the Church on the Hill, the altar paintings are in Sibiu. The leadership of the Lutheran Church in Romania decided to gather the most valuable objects from the village churches and to move them to places where they will be safe. The altarpieces from Saes, Cund and Beia have been brought to Sighisoara and installed in the Church on the Hill. The altarpiece from Saes serves as the main altar in the choir, the Cund altarpiece is on the east wall of the south aisle, and the Beia altarpiece is on the east wall of the north aisle. The Saes Altarpiece consists of a large central picture (“kinship painting”) in which are portrayed the relatives of Jesus on his mother’s side as they might have surrounded him in his lifetime. Above this is a lunette of equal width with Saints Catherine (above), Appolonia (left) and Barbara. Below the central picture on a very narrow predella the Raising of Lazarus is depicted. Under this on a disproportionately large predella originating from another altar we can see (lefi to right) Jesus praying in the garden of Gethsemane, the Crucifixion and the Descent from the Cross. The central painting is framed in a late gothic tracery with a design of vegetation. The Cund Altarpiece is built around a shrine, and has two moveable and two fixed wings. The shrine is built on a predella. It presumably once contained a larger sculpturee and four carved figures fitting into niches, all five of which were probably removed in 1545. On high holy days the opened wings of the alter show four scenes from the life of Saint Nicholas; The legend of the three sleeping girls, the rescue of the three slandered and judged knights, the rescue of the pilgrims in distress at sea, and the miracle of the grain. The burial of Christ is depicted in a well balanced composition on the predella. The empty shrine once probably held a sculpture of St Nicholas or of the Virgin Mary, which was replaced by a crucifix in the 18* century. The Beia Altarpicce is a four part altar with two moveable and two fixed wings. The carved components from the central shrine and the predella have gone missing. The carved tracery is still partially intact and together with the finely worked frame and canopy on the festive side of the wings surround the story of Saint Ursula. 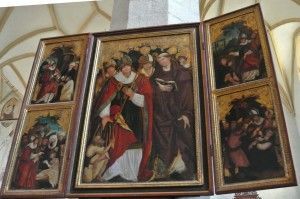 The four remaining pictures show her journey up the Rhine to Cologne, entering a church in Rome, the blessing by Pope Cyriacus and her martyrdom in Cologne. In the middle we can see the Judge of the Earth (a baroque replacement figure). The date 1513 inscribed at the bottom of the reredos makes the Beia allarpiece the oldest of the so-called Sighisoara altarpiece collection. The Saint Martin Altarpiece, which came from the Monastery Church in Sighisoara, is kept on the middle pillar on the south side of the nave. Once a winged altarpiece, all that is left are the central picture and two side panels. The central picture shows Saint Martin with Saint Dominic and three other saints in the background. In the foreground to the left kneels a beggar. On the open side wings are depicted four scenes from the legend of Saint Martin: the clothing of a beggar, the raising of a dead boy, the reviving of a hanged man, and the absolution of a dying woman. 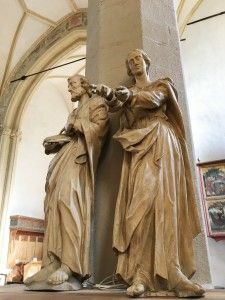 Johann Stoss, one of the sons of the sculptor Veit Stoss, is regarded as the master artist responsible for this altarpiece, and also of the altarpieces from Beia and Fiser. 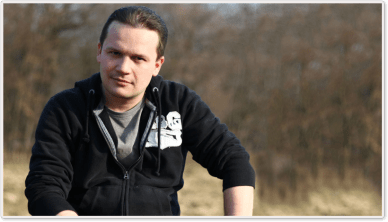 It is well known that Johann Stoss learned the craft of painting, and also that he came from Slovakia and settled in Sighisoara, where he died in 1530. The Saint Martin altar was probably painted between 1515 and 1520. The oldest painting, discovered only in 1998, is on the underside of the arch supporting the south lower. It is a painting showing the protective authority of Saint Nicholas over the church and has three levels: The | Crucifixion, the Holy Trinity between Abraham and Jeremiah, and a scene from the legend of Saint Nicholas and the three poor girls. The painting probably dates to the period 1370-1400. From the same period are possibly fragments on the north wall of the choir which are covered by the choir stalls. The painting representing curtains in the apse, including the niche in the south wall, and the cross with apostles, might belong to the period 1483-1495. Most of the wall paintings are from this period. High on the north wall of the choir Mary Magdalene is depicted with a kneeling donor, along with the date 1483. Below and to the left of the tabernacle an angel with the Passion of Christ’s suffering, and below that, partially covered by the tabernacle a row of four female saints. Above the “triumphal arch” separating the nave from the choir is a painting of the veil of Saint Veronica, held by two angels and surrounded by a kneeling pair of donors with their coat of arms- probably ValentinusPiktor. Mayor of Sighisoara in 1490, and then from 1496 to 1498. The east wall of the north aisle was covered by a monumental painting of the Last Judgement. In the upper part Christ is enthroned on a rainbow, and at his feet kneel Mary and John. The apostles are also present, and the angels show some of the instruments of Christ’s suffering at the Great Judgement. In the left comer Saint Peter leads the host of the elect to heaven. In the right corner the Archangel Michael chases the group of sinners to hell. The black baroque frames below the Last Judgement and on the north wall of the choir were used for votive tablets and date from the 18″‘ century. The paintings on the vaults over the north entrance are well preserved. They represent the Archangel Michael with the devil and the Evangelist Matthew. One picture shows the Archangel Michael with a scale weighing the good and evil works of someone who has died, whereby the good works, portrayed by a small angel, outweigh the bad. On his right is a humorous representation of a chained devil. The picture opposite of the Evangelist Matthew is dated 1483. 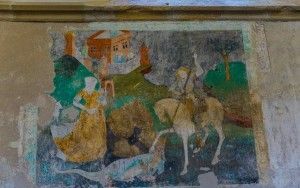 The paintings on the north wall of the church are most likely from the first half of the 15,h century, and show the fight of Saint George with the dragon. In the first picture Saint George appears in front of the castle. From within the walls the king and queen watch the beginning of the fight. A page comes out of the castle and the princess points towards him. In the second, less well preserved picture Saint George is stabbing the wild animal (a winged reptile) and the princess is kneeling on the top of a mountain. In the past picture the saint is returning in his knightly armor together with the princess, who has the tamed dragon on a lead. Under the balcony there are wall paintings on the north wall (left) representing two saints and Saint Christopher with the Christ Child. On the south wall is part of the torture of Saint Nicholas, extending from behind the pillars into the nave. The remains of wall paintings are recognizable on the exterior walls of the choir, under the east; (Crucifixion) and the south west window. The Romanesque crypt beneath the full length of the choir was built of stone masonry and has three windows facing north, east and south. These windows are visible from outside in the base of the choir. The crypt has an masonry altar. In the 18th century the room of the crypt was transformed into a burial chamber with a central aisle and on each side, three rows of coffin niches, ten in each row. The crypt can be reached by a stair leading down from the centre of the church nave. It is the only crypt in a Transylvanian church. 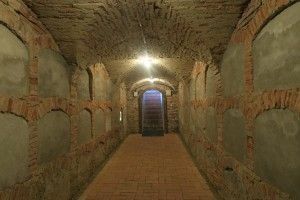 In the coffin niches leading Sighisoara citizens were buried (priests and wealthy townsfolk) from about 1780 till 1815. The bones of those buried here and the remains of the coffins were visible until the 1990s. During the big restoration project of 1992-1999 the niches were walled up. 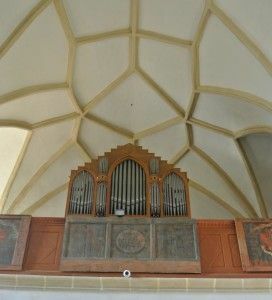 The current manual organ was built by the Brasov organ builder Carl Schneider in 1858. Later a pneumatic pedal was added and the neo-gothic appearance taken away.